Belchite offers a unique place to visit in Spain and is a monument to the Spanish civil war which tore through the country between 1936 and 1939. Left "as is" after the war this battle destroyed village in Aragon offers visitors a chance to appreciate both the history of Spain as well as an understanding of the innocents that are affected by any conflict. 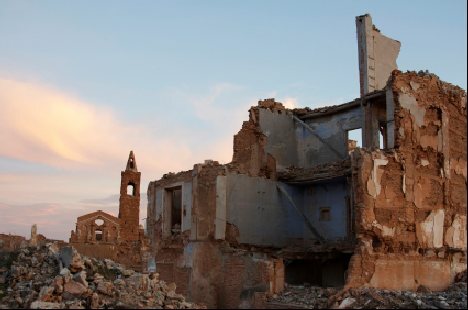 Today the village is amde up of two parts, the new village Nuevo Belchite, and the old village which has been left undisturbed as a set of ruins from the Spanish civil war. The old village was ruined by the intense fighting between the Nationalist (Facist) and Republican (Communist) forces in the last week of August and 1st week of September 1937 (24/08 - 7/09). 1937 had seen the Nationalist forces mount a campaign to conquer the northern provinces which was fiercely resisted by the republicans. As part of that resistance the Republicans lauched a series of harrying counter attacks along areas of the Nationalist front line in Aragon where individual villages and towns were known to be weakly defended. Belchite was one such town. 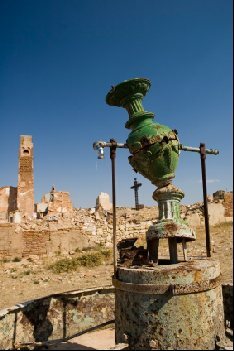 Quickly occupied by the republicans the village of Belchite was held throughout the Nationalist counter attacks although at the cost of having the village reduced to ruins. The strategic value as a potential jumping off point for a future attack on Zaragoza (never materialised) was not lost on Republican commanders and whilst surrounding villages fell to the Nationalist forces Belchite wasn't captured until later that year. After the civil war there were a few inhabitants in the ruins however Franco wanted to send a message to ex republicans and decided that a new village be constructed next door and the village preserved as a monument to the irresistibility of the Nationalist forces. Thats to say that although the village was held for so long by the republicans it eventually fell to the "superiority" of the nationalist ideology. Being just 50 km from Zaragoza Belchite offers tourists the chance to see something truly unique in Spains history whilst at the same time visiting rural Aragon. The new village offers food and refreshment in bars and cafeterias and a full day or half day excursion to the ruins will leave one contempleting the differences between old and new Spain. The ruins of the old village are open to the public and although certain areas (where risk of a collapsing building etc exists) are roped off the remainder is open to the countryside and the visitor can walk freely amongst the bullet scared buildings, shell shattered structural ruins and visit the hollowed out village church. Getting to Belchite is done either by hire car or bus service from Zaragoza. By car you need to leave Zaragoza taking the A-62 (later becomes the N-232) until just after Guadalajara (this is a village not the town of Guadalajara in Castilla La Mancha) where you turn off to the right and join the A-222 which is signposted Belchite. We strongly advise checking with your hotel or the bus company before setting out for the day. The ruins are around a 20 minute walk from the bus stop in the new village and as such July and August are best avoided as visiting times due to the intense heat. The new village was proported to have been built by captured Republican soldiers who were interned in the nearby concentration camp which bore the village name. Belchite is home to a free museum, open on Saturdays and Sundays only (timings: 1030-1330 and 1600-1900), celebrating historical rural life, pastimes and tooling in Aragon. The civil war conflict was not the only battle to be fought in Belchite Spain as it also provided the scene of a battle between French and Spanish forces in the Independence war of 1809.